I'm a bookworm. I've been so all of my life. There are old photographs of me as a toddler sitting underneath the living room end table reading Mother Goose rhymes. Though cramped, my small space was perfect to spend time with my favorite storybooks, whether I could actually read them or not was completely irrelevant. I distinctly remember the day I outgrew my small reading cove; my neck was sore from bending over and my legs jutted out between the table legs. At the ripe age of three and a half, I had outgrown my special reading corner. Above all, I remember feeling sadness about losing this place so special to me. Evidently the perceived tragedies to a three year old are strong enough to leave an impression well into adulthood. My books and I would simply have to find someplace else to delve into the world of fiction. Nevertheless, much of my childhood was spent between the worn pages of a good book. Fiction and fantasy, kings and queens, dragons and mythical creatures—I loved them all. Reading of far off places, places that never existed nor will ever exist, made my imagination soar. As soon as my eyes start taking in the words on the page, my mind fades away from the Times New Roman font and a fantastic story begins playing out in my head. The faster my eyes dance across the page, the more vivid and real the details of the book become. Fantasy, fiction, and food—my personal trinity of good books. To this day, I struggle to pick up a nonfiction book and read it all the way through. Perhaps my childhood is so rooted into fairy tales and foreign worlds that to stray into the details of reality takes away a little of that magic. Whatever the case may be, my bookshelf is firmly filled with adventures and tragedies (with just a few culinary memoirs to break up the monotony). When I was younger, I always envisioned myself as a fiction writer, spinning predictable, but engrossing tales of teen romance. Yet, when I sat down to write chapters, pages, or simple paragraphs of the ideas floating in my head, the words didn't flow. They stopped, utterly and completely, and I was left staring at a blank page. 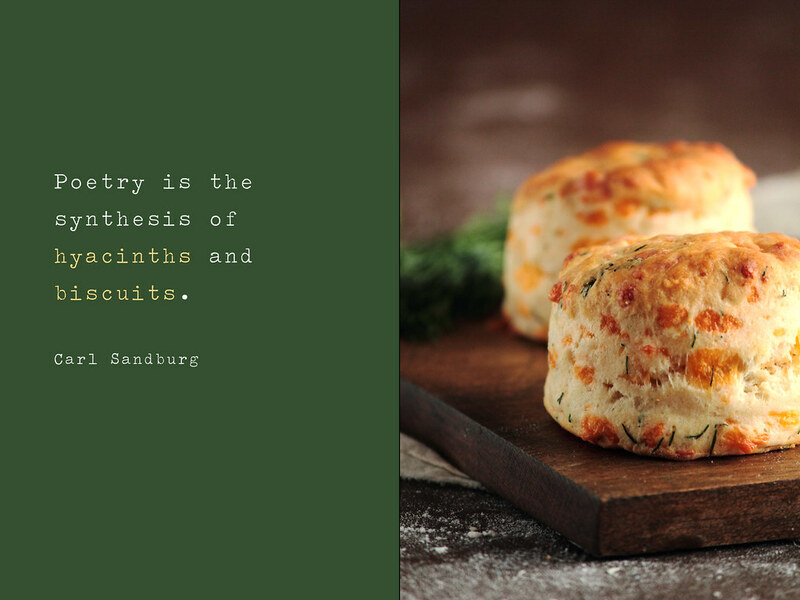 Yet, when I sat down to journal or to write short essays about silliness or food, the words came in droves. I'd often have to cut them back or stop them all together, fearing I'd write something too long for anyone (or myself) to want to read. It's ironic, really. Nonfiction books are the one genre of books I can't quite bring myself to read, yet is the only style I can seem to write. Which genre of books do you prefer? 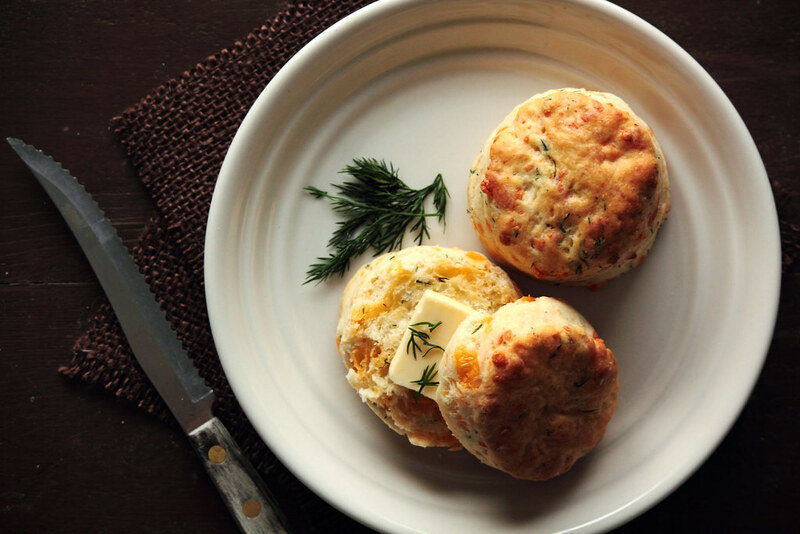 Cheddar Dill Biscuits are tender, flaky, and full of flavor. 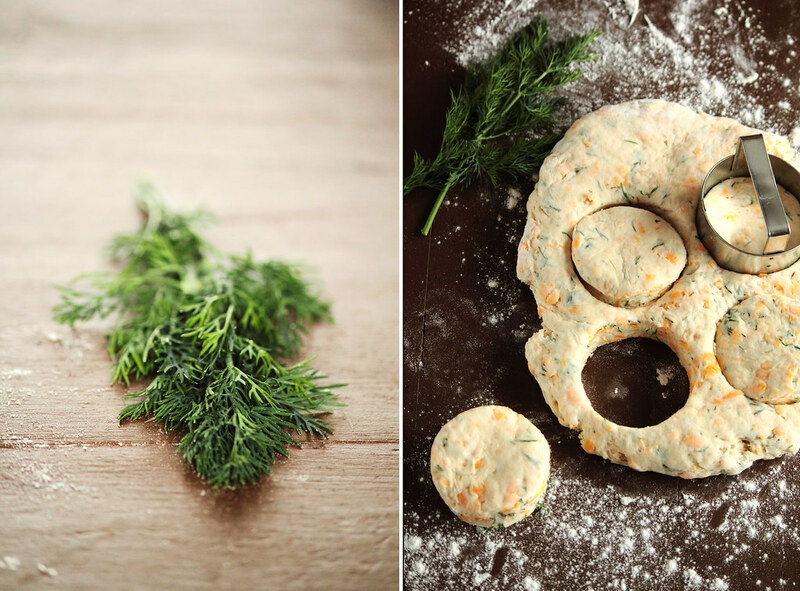 I love the sharpness of the cheddar cheese contrasted against the fresh dill. 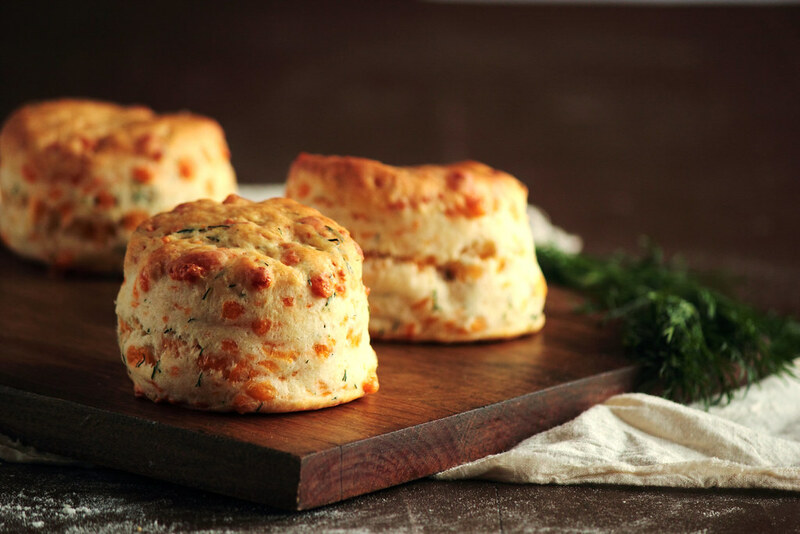 The biscuits rise using baking powder, while the butter gives the biscuit the coveted flaky layers. 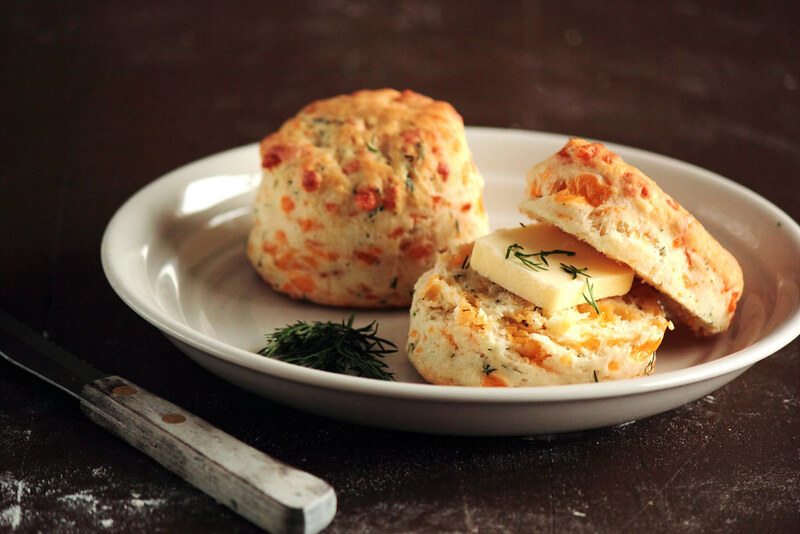 The biscuits are wonderfully cheesy and perfect whether they are served plain or with a simple butter spread. 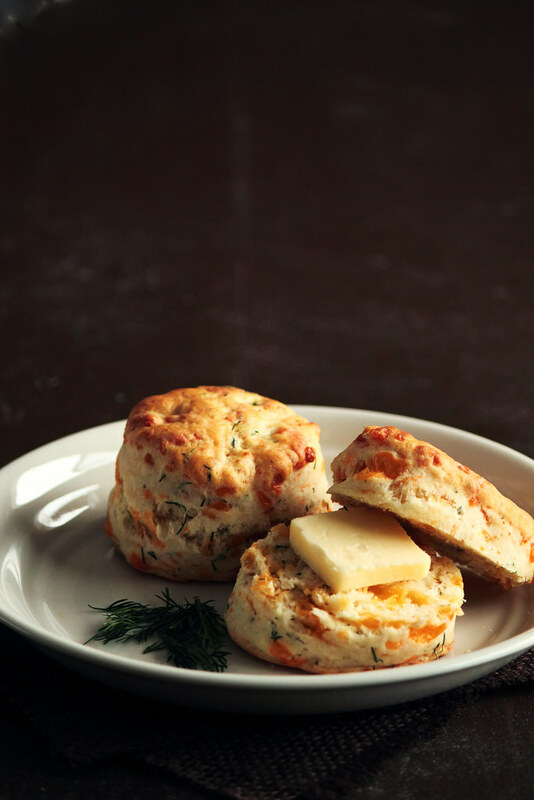 For tips on achieving mile-high biscuits, check this out!